Ruby wants to tell a great story about wonderful things. She is also determined to exclude bears at all costs. She’s sick and tired of tales containing bears. Ruby creates a beautiful princess living in a faraway castle with her parents. There’s a deep dark forest and a monster. What better story could there possibly be? Ruby is so busy saying there will be no bears that her story misses some very important details. Her characters are a bit forgetful. They need a little bit of help. The fairy is so busy painting scenes for Ruby’s story, she misplaces her wand. When the monster kidnaps the princess, poor fairy is nowhere to be seen. Who saves the day, you might ask? Well, you’ll have to look very carefully at each page to find out. Is Ruby right? Is this the prettiest, most exciting, scariest story book ever? And are there really no bears? 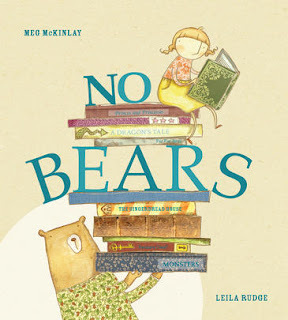 No Bears is a delightful ‘look and find’ tale for tiny tots (3+). Humour hiding in the illustrations complements Ruby’s tale to perfection. It is the funny side of the story that will draw No Bears from the book shelf on repeated bedtimes. What better way is there to drift off to sleep than with a giggle? As the audience grows a little older, the poignant side of No Bears might reveal itself. Ruby’s attempt to exclude a favourite character backfires. Who is excluded in the end, even though they don’t realise it? Hmmm. Food for thought for every age.